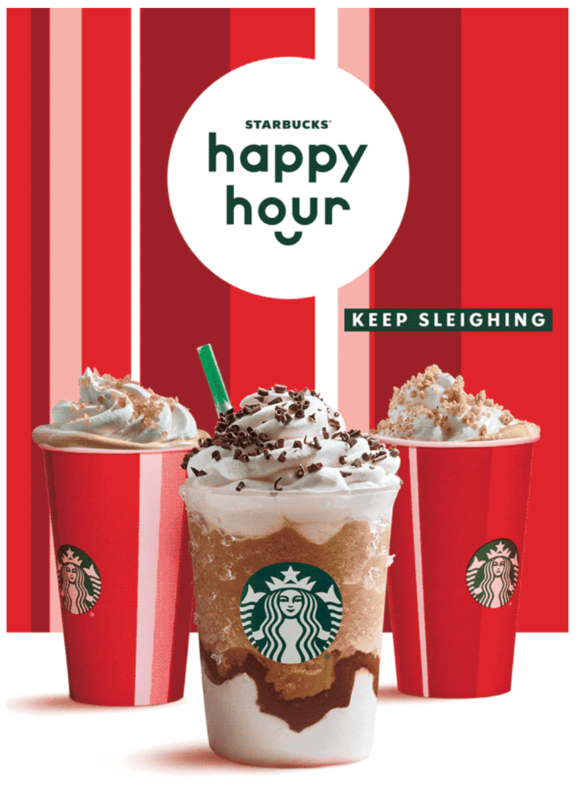 Starbucks Canada’s Happy Hour is back! Buy one get one FREE when you buy any holiday beverage, size grande or larger, starting at 3 p.m. today December 6 2018. Holiday beverages include handcrafted hot chocolates; and hot, iced, blended and crème versions (when available) of the Peppermint Mocha, Peppermint White Chocolate Mocha, Caramel Brûlé Latte, Chestnut Praline Latte, Eggnog Latte, Chai Eggnog Latte, Gingerbread Latte, Pumpkin Spice Latte, Salted Caramel Mocha, Cardamom Latte, Juniper Latte and Juniper Flat White.